Friday 22 February at 6pm, at the Presbyterian Community centre, 91 Tenby Street, Wanaka. Emeritus Professor Carolyn Burns, Department of Zoology, University of Otago. Do we understand, appreciate and value our lakes enough? 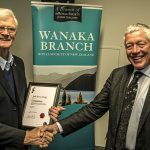 I discuss some of the benefits of lakes, some of the problems we face in New Zealand with respect to water quality and biodiversity, lake conservation and management, and how management might be improved in the face of population expansion and growth, increasing pressures from tourism, effects of climate change and escalating numbers invasive species. Emeritus Professor Carolyn Burns CBE, FRSNZ, of the Department of Zoology at the University of Otago is internationally renowned for her research into freshwater ecology, especially that of the large lakes of the South Island. A recipient of the Naumann-Thienemann Medal, the world’s top award for limnology (the study of inland waters), she has contributed her scientific expertise to conservation, (Regional Councillor for Australasia and Oceania on the IUCN World Conservation Union), as well as a long-serving member of two statutory authorities that provided advice to the Minister of Conservation – the Nature Conservation Council (chairing it 1978 – 1983) and the National Parks and Reserves Authority. In 2017 Professor Burns received The New Zealand Association of Scientists (NZAS) Marsden Medal and in 2018 was awarded the Royal Society of New Zealand Thomson Medal for her outstanding leadership and service to environmental science and conservation.